Background: Achieve greater operational efficiency, and effectively compete with online retailers through end-to-end analytics and inventory accuracy. 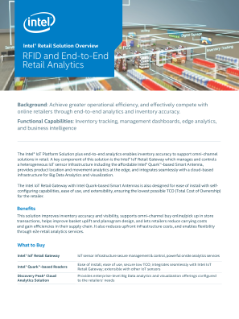 The Intel® IoT Platform solution plus end-to-end analytics enables inventory accuracy to support omni-channel solutions in ...retail. This solution showcases how inventory can be instrumented in a live demonstration that tracks RFID tags shared with attendees during NRF. A key component of this solution is the Intel® IoT Gateway which manages and controls a heterogeneous IoT sensor infrastructure including the affordable Intel® Quark™ technology-based smart antenna, provides product location and movement analytics at the edge, and integrates seamlessly with a cloud-based infrastructure for big data analytics and visualization. The Intel IoT Gateway with Intel Quark technology-based smart antennas is also designed for ease of install with self-configuring capabilities, ease of use, and extensibility, ensuring the lowest possible TCO (total cost of ownership) for the retailer. This solution improves inventory accuracy and visibility, supports omni-channel buy online/pick up in store transactions, helps improve basket uplift and planogram design, and lets retailers reduce carrying costs and gain efficiencies in their supply chain. It also reduces upfront infrastructure costs, and enables flexibility through end-to-end retail analytics services.